Try any ACUVUE® Brand Contact lenses for free before you decide to buy. Beginning a free trial is easy. Just follow the steps below. Download your certificate and bring it to your appointment. Get fitted for your perfect lenses and take your free trial pack home. 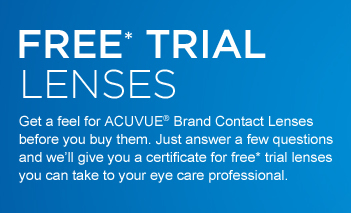 You may also receive free trial lenses by visiting any participating Eye Care Professional, who will determine if ACUVUE® Brand Contact Lenses are right for you. Trial lenses are available while supplies last.